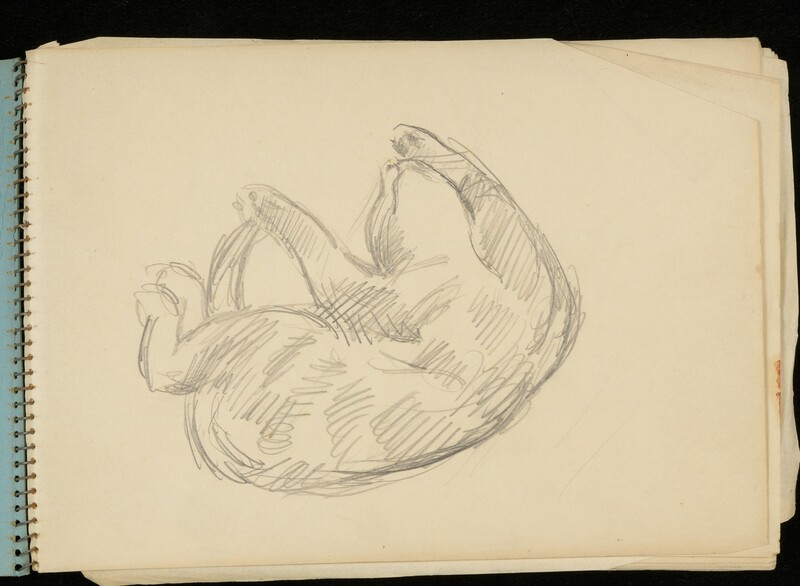 These sketches of lounging cats come from a sketchbook labelled ‘VB’ for Vanessa Bell. They recall Duncan Grant’s 1932 painting ‘Opussyquinusque’, now hung in the Dining Room, near to Edward Wolfe’s 1918 work ‘Still Life with Omega Cat’. 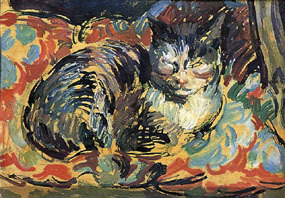 Grant’s cat was exhibited at the Venice Biennale in 1932, and is now available as a beautiful print at the Charleston gift shop http://www.charleston.org.uk/products-page/prints/cat-opussyquinsque/. 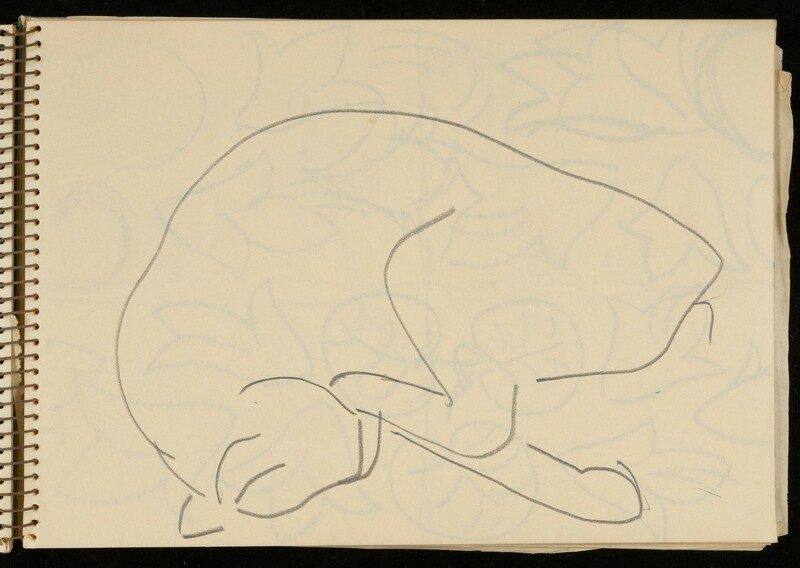 Another example of the Charleston artists love of felines is Duncan Grant’s ‘Cat on a Cabbage’. 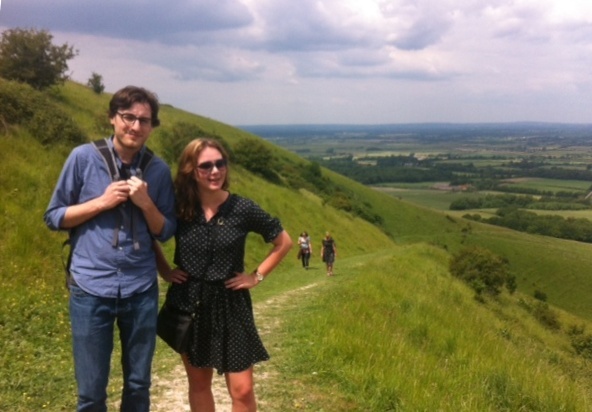 During a lunch hour several members of staff walked to the top of the chalk ridge on the South Downs behind Charleston (see above). Through the dairy farm, the cows swishing flies with their tails as they ate their hay, we made our way up on to the Old Coach Road. 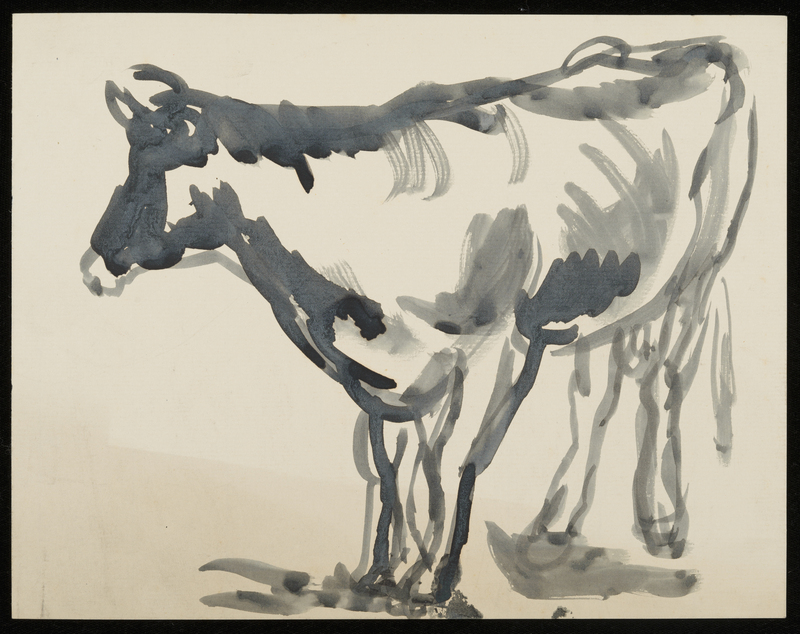 In the Angelica Garnett Gift there are many sketches of the cows which would have grazed in the fields surrounding Charleston as they do today (see an example below). A narrow turning off the Coach Road lead us to the green and open ascent of Firle Beacon with Charleston and the cows below us and the Sussex countryside expanding outwards. Along the path we encountered sheep, which also appear in the Gift (see below). 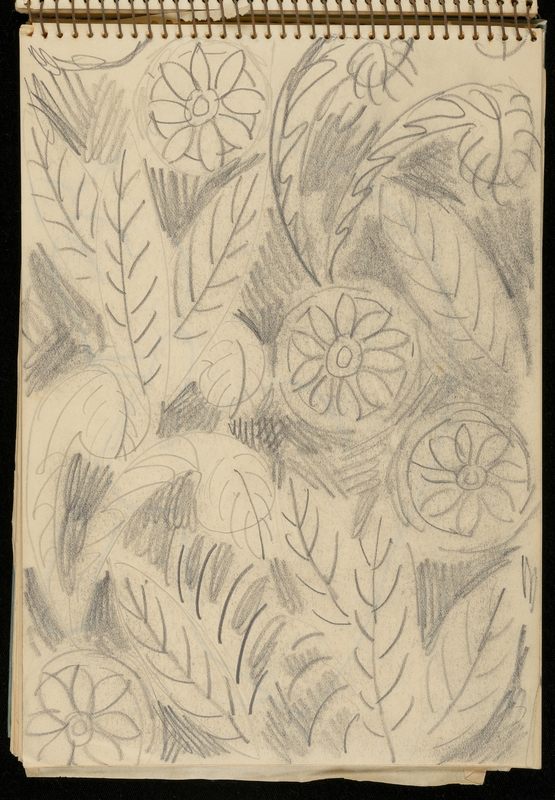 The glorious views, wild flowers and butterflies we saw all seem to be reflected in the decorative and organic shapes and forms that Vanessa Bell and Duncan Grant depicted throughout their work (see below). 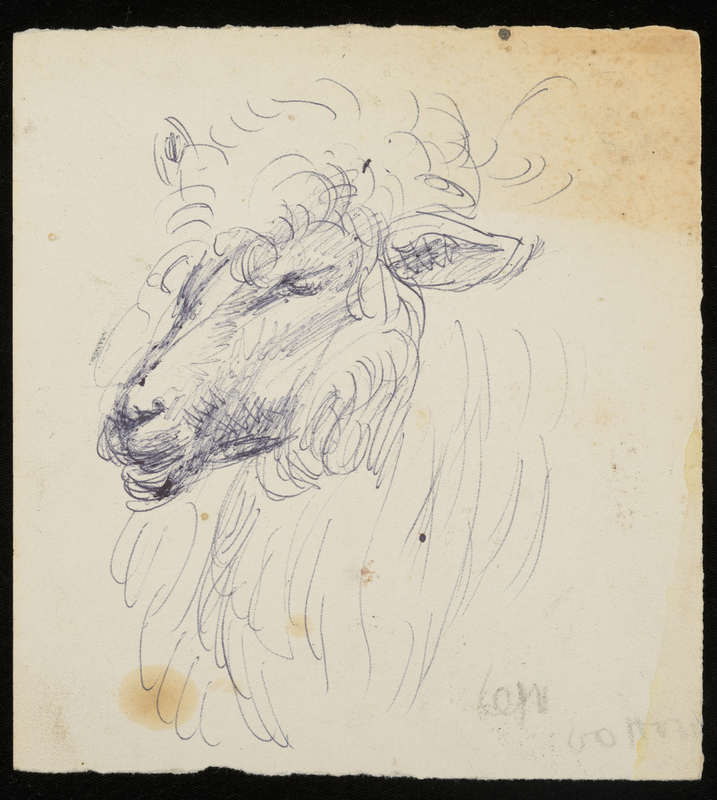 Clive Bell (1881-1964) was an art critic and husband to Vanessa Bell. Clive and Vanessa separated shortly after the birth of their second son, but remained friends. 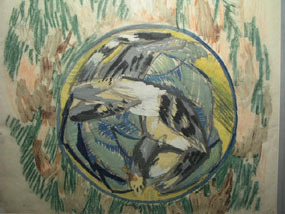 Clive Bell continued to provide Vanessa Bell with financial support, and visited Charleston regularly. 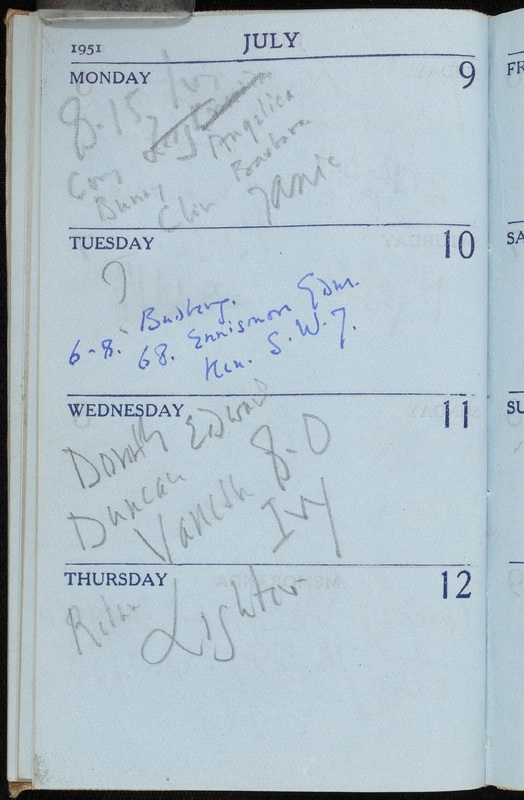 An insight into his life can be found not only in his various belongings that are on display in the house, but also in the Angelica Garnett Gift, which contains his pocket diary from 1951. The diary evidences Clive Bell’s contact with people connected with Charleston. Vanessa Bell, Duncan Grant, their daughter Angelica Garnett and her husband David Garnett, known as ‘Bunny’, all feature in entries (see image below). The word ‘Ivy’ appears next to two entries. On the one hand, ‘Ivy’ could refer to another person. On the other, it may indicate a dining spot, perhaps even The Ivy restaurant in London’s West End. The Ivy would have been a fitting choice for Clive Bell in 1951, with its clientele drawn primarily from the creative industries as it is today, over sixty years on.